Parts are the building blocks of your game. 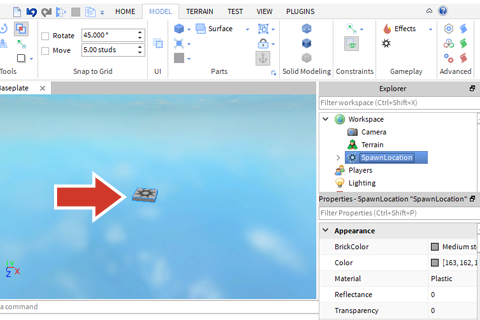 You can use them to build environments and models for your game. In Home tab, click Part. A part will appear at the exact center of your camera view. If you want more control over where the part appears, zoom in your camera and center it on where you want the part to appear. There are four different kinds of parts; Block, Sphere, Wedge, and Cylinder. You can change which part type the part button creates. Use the drop-down menu under Part and select a new part type to create. Use the camera controls or press F to get a better view. Drag the arrows to move the part around. Collisions and snapping are two settings you can use to get greater control when moving around parts. As you move parts, you may notice a white outline whenever a part touches another part. This indicates that a collision is happening. 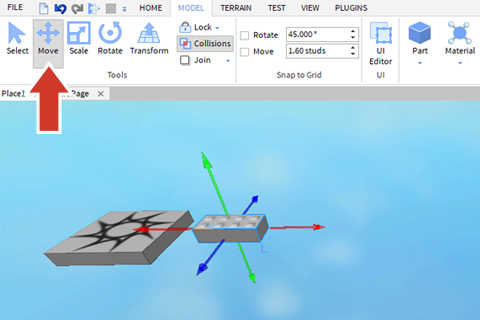 In Roblox Studio, the Collisions feature lets you control if parts can move through each other. 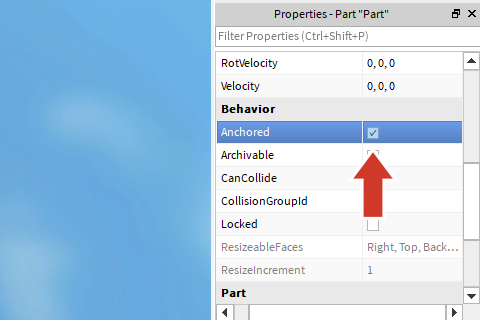 Collisions On: You won’t be able to move a part into any anyplace where it overlaps another part. Collisions Off: You can freely move parts all around. If Collisions is on, the button will be highlighted grey. Snapping is the amount a part will move, scale, or rotate at a time. If you notice a part moving several studs (the Roblox unit of measurement) at a time, this is because of snapping. Snapping is useful when creating items that need to be placed exactly, like how walls of buildings need to be placed at the ninety degree angles. Keeping it on, even for a small number, also helps keep our environments tidy as freely moving parts around. It’s recommended that students turn off snapping by default. This makes it much easier to move around parts. Turn snap off by unchecking the box next to Rotate or Move. Enter different numbers for Rotate or Move (or click the small arrows within the fields). In Roblox, studs are the basic unit of measurement. Below, the white grid shows the size of each stud. If you set Move to 1.00 studs, parts will move by a one full stud each step. An obby usually starts out with a simple jumping puzzle. As a good game designer, you want to make it easy for new players to get started. If you make it too hard right away, players might just quit instead of continuing to play. Move the part slightly away from the SpawnLocation to create an easy jump. Don’t test your game yet. If your parts get far away from you, don't forget you can bring it back in focus by selecting the part and pressing F.
If you playtest your game at this point, you’ll notice any parts you’ve added (other than the SpawnLocation) will fall. Anchoring will stop parts from falling. They’ll even stay in place when players and other objects bump into them. Select the part you would like to anchor. Go to the Properties window. Save & playtest your game. An entire level of the same looking part wouldn’t be that exciting to players. 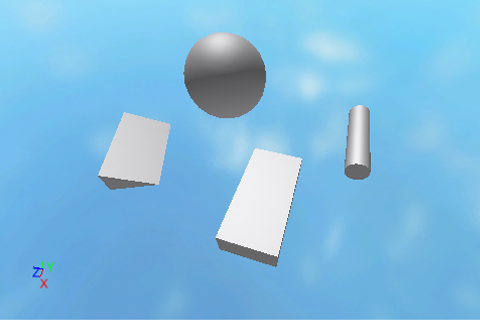 By scaling and rotating parts, you can create different parts that will add variety to your obby. In the Home tab, click on the Scale button. Drag the spheres to change the size of the block. If the part is scaling or rotating in steps, you may need to adjust or turn off snapping. If the part is being blocked from moving or rotating into another part, turning off collisions might make things easier. This is the very beginning of your game, so you don’t want the jumps to be very difficult yet. You want the player to think your game is fun and keep playing. As you build, experiment with rotation, scaling, snapping amounts and turning snap off. Add two more parts to your game. If any of your parts fall down, be sure to anchor them. Sometimes you might find that a part is getting in the way of you selecting another part. To make it so that a part can’t be moved, you can lock it in place. Select lock or unlock from the drop-down menu. Click on the part you would like to lock (or unlock). Once you lock the part, you will no longer be able to select it. The starting area is the first thing a player sees when they land in your game. They’re a place to introduce new players to your world, and begin setting theme for your game. Think of the last few games you played. What did the starting area look like? What did they make you think about the game? Starting areas can be as simple as one big part to create a floor, or as fancy as you’d like. Depending on your time constraints, you can give students just a minute and have them create a simple floor beneath the SpawnLocation. 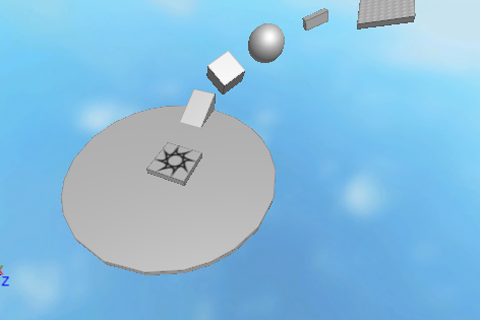 Add 4-5 parts of different sizes and shapes to create a jumping puzzle. Save frequently to avoid losing potential work. Frequent play-testing helps students identify and fix problems early on. For example, parts might not be lining up the way you think you will if you are only looking from one direction. At the end of your first jumping puzzle, have a larger landing area for your players to take a break on. Create a floor at the end of your first set of jumps. This will act as level end and give players a place to rest.